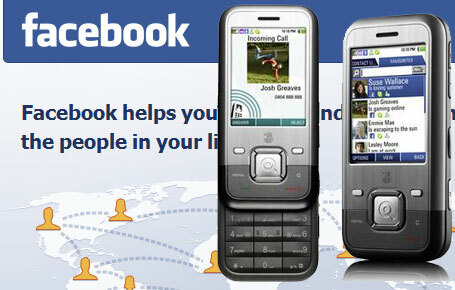 The new Facebook for SIM app means users can get Facebook access from any phone, not just the upmarket brands. This could be a significant boon for the social networking site, enabling it to gain tractions in markets where people cannot afford smartphones. Developed by Gemalto, an Amsterdam-based digital security group, the app runs on the SIM card, not the phone. It will give users access to all of the text-based services on Facebook, including status updates, friend requests, wall posts and messages. ‘What we are offering is an application that works on any phone, even if you don’t have a WAP browser. This will work on any kind of phone. You don’t need a data plan to run this application. You don’t have to configure your phone. You just put the SIM in the phone and a Facebook-enabled application will open up, said Jean-François Schreiber at Gemalto. According to Gemalto, access would be free for the first 15 days, before the network would step in and charge a flat fee for a fixed number of days. The app works by dividing messages into 160 word sections and sending them via SMS to a gateway controlled by Gemalto. Their server then interacts with the Facebook servers to update individual’s profiles. There are more than 5 billion GSM connections in the world, according to the GSM Association. Facebook has over 500 million subscribers. All designs are amazing ,its create new ideas thanks for sharing. I really enjoyed to read your article ,it good to reading,,,and thank you for sharing with usI found this is an informative and interesting post so i think so it is very useful and knowledgeable. I would like to thank you for the efforts you have made in writing this article. I am hoping the same best work from you in the future as well. In fact your creative writing ability has inspired me. We have been buying fans from http://www.fanbullet.com for a few months now, and I can tell you that the traffic we get from our Facebook page is more than the traffic that Google gives us.